The news video tells about the grand opening of the exhibition "German Karl Bulla, the first Russian photo reporter" , held in a TV-format on October 12, 2018 in the Presidential Library, as well as in the German cities of Dresden and Leipzig. The exhibition includes more than 80 rare photos on 45 tablets. The exposition of the photographic heritage of the famous Bulla dynasty was presented at the German-Russian Institute of Culture in Dresden. This is a joint project of the Karl Bulla Foundation of Historical Photography and the Presidential Library . I. Sennikova, Yaroslava Valeryevna. Ii. Yarosh, Vladimir Mikhailovich. Iii. Kondrashov, Kirill Aleksandrovich. Iv. Presidential Library (St. Petersburg) .1. Bulla, Karl Karlovich (1855 - 1929) - Multimedia publications. 2. 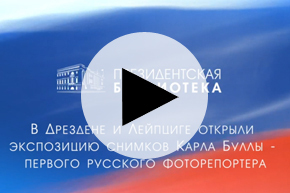 Presidential Library (St. Petersburg, city) - Events - 2018 - Multimedia publications. 3. "German Karl Bulla, the first Russian photo reporter", exhibition (Germany; 2018) - Multimedia publications. 4. The people (collection). 5. Russia in the faces (collection). 6. Russia and countries of the world (collection).